Jim Rogers, CEO of Kampgrounds of America, has been a long time enthusiast of the Rolla Roaster. He has almost as much enthusiasm for the rolla roaster as Bob Holzer, the inventor. Bob hopes that one day every family will enjoy making s’mores without having to get a stick or burn their hands on wire, and Jim has the same goal, as he takes a journey through the history of campfire sticks and finishes with the greatest way to roast s’mores, on a rolla roaster. Check out this video of Jim describing the timeline of the different marshmallow roasting sticks and way to make the best s’more. The rolla roaster seen in this video custom rolla roaster made for KOA it has the logo and is in the famous KOA yellow color. “Your dad may have insisted upon the old “Huck ‘n Tom” solution of trying to find a greenish stick, whittling it down on a rock. If you didn’t get a sliver trying to ram the marshmallow onto the end, you would get one in your tongue as you tried to bite into it. Then came the wire hanger. After nearly taking out your eye and everyone else’s trying to undo the twisted metal, you’d hold the drooping wire, watching as it lowered the marshmallow ever closer to the glowing embers until it would either burst into flames or land with a resounding “plop” into the dirt. A plethora of products followed, each claiming to be better and brighter than the next, but were never able to quite deliver that pure marshmallow perfection. Too often, the marshmallows were burnt, raw, falling to the earth, melting into the fire or lobbed like flaming missiles onto the tops of our tents. That is, until Bob Holzer of Orofino, Idaho revolutionized (literally) the way marshmallows are roasted. Having had polio when he was three, Bob grew up with only the use of one arm. Finding ways to do things single-handedly was second nature to him. In the early 1980’s, Bob and his wife lived on Idaho’s Clearwater River in a home nestled in the pines. On summer evenings, they would sit around a fire pit roasting hot dogs and marshmallows. Bob decided that it could be done better. At first, he created simple wires with a forked end. Bob decided that the roaster was too bulky, and realized that a telescoping mechanism would eliminate the problem. Using antennas from an electronics store, he returned to his shop and built what became the Rolla-Roaster. Still built in Orofino, the high-quality Rolla Roaster hasn’t changed much in 30 years—and it sells for only $1 more than it did when Bob first introduced them. His relationship with Kampgrounds of America has been a long and happy one as well. For more information, or to see Bob’s other products, please visit rollaroaster.com. 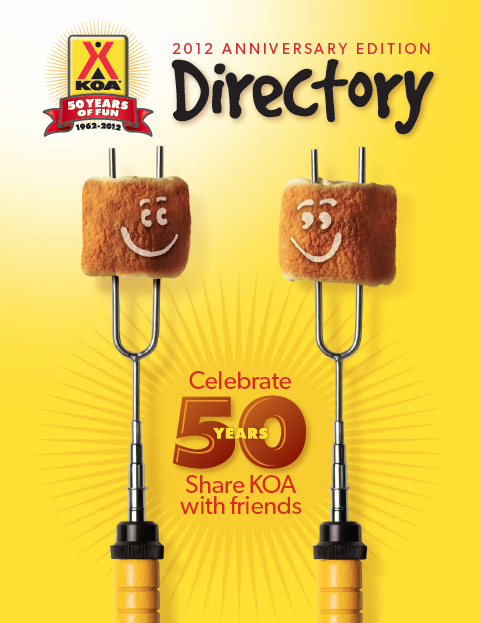 KOA Campgrounds directory for 2012. Talking marshmallows on the rolla roaster!